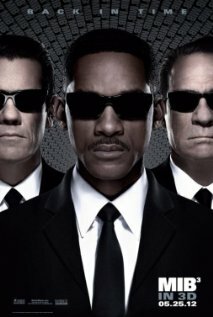 In Men in Black 3, Agents J (Will Smith) and K (Tommy Lee Jones) are back…in time. J has seen some inexplicable things in his 15 years with the Men in Black, but nothing, not even aliens, perplexes him as much as his wry, reticent partner. But when K’s life and the fate of the planet are put at stake, Agent J will have to travel back in time to put things right. J discovers that there are secrets to the universe that K never told him — secrets that will reveal themselves as he teams up with the young Agent K (Josh Brolin) to save his partner, the agency, and the future of humankind. Agent J and Agent K never fail to provide entertainment. Battling the aliens and save the earth, same old same old but I loved the time travel idea by jumping off a tall building and how they show Griffin ability to jump through different fabric of time dimensions. I am a fan of MIB franchise and I just realized that the first movie was back in 1997. It has been 14 years since the first movie came out. Will Smith looked almost exactly the same from the first movie with the exception he bulked out a bit over the years. He definitely had the highway miles if you know what I meant especially if you have already watched the movie. Will Smith was being Will Smith but the star in the movie was Josh Brolin. He made an memorable and exceptional impersonation of Tommy Lee Jones. The other character I loved in the movie was Griffin played by Michael Stuhlbarg. This will probably last MIB movie for Tommy Lee Jones. I didn’t see the touching ending coming at all. I enjoyed it and I hope everyone did too.